Terms like tribal sovereignty, Native Rights, and co-management, are all open to interpretation. One of the most vocal groups in the Y-K Delta, Yupiit Nation, recently met to hash out their vision of future governance in the region. Members have a spectrum of views about what tribal sovereignty really means. A few dozen people gathered in the Akiachak School Gym last month for two days of Yupiit Nation discussions at their annual meeting. A similar set of topics comes up at every meeting: subsistence, co-management, local law enforcement; the most basic idea of governance and what role local tribes, who are members of Yupiit Nation, want to play. Ivan M. Ivan is the Tribal President in Akiak. “We’re not trying to become a government that runs villages. The villages have their power. By themselves to control their own destiny but collectively together I believe they can help each other,” said Ivan. There is however a long-standing discussion about forming a regional tribal government. Yupiit Nation Chief, Mike Williams, said after the meeting that vision includes a legislative, executive, and judicial branch. He says the current governmental structure holds tribes back. “There’s 56 individual federally recognized tribes in our area and the respect is there. But if 56 unite together I think we can begin to deal with these issues that are not good and help us manage our way of live as we have for thousands of years,” said Williams. Williams calls Yupiit Nation a consortium of federally recognized tribes. Formed in 1978 with 19 tribes, Williams says there are now 12 tribes with active members. The core of the group, however, is centered in Akiak, Akiachak, Tuluksak, and Kwethluk. Critics say the outspoken group doesn’t represent the majority of Y-K Delta tribal members. 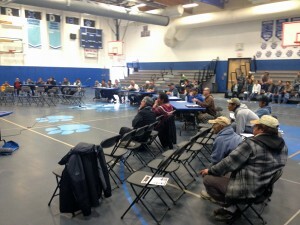 Still, the group pushes for a shift of the power to tribes in rural Alaska. Phillip Peter Senior is Akiachak’s Native Community President. He says his ancestors controlled their own destiny and today there are too many laws and regulations. Still, he wants tribes to be partners with existing governments. “The vision is to help ourselves. And work with our federal and state governments We’re not trying to take away the power from the government and state. All we want to do is work with them,” said Peter. Moses Owen from Akiak takes a harder line for the Yupiit Nation. “You know it’s getting tougher for us to survive, with the laws, the regulations, we have have to get back to where we were before. No laws, no rules, just our way of life, we want to practice that,” said Owen. Yupiit Nation Chief Mike Williams says the group held off on elections, which were scheduled for their meeting on August 22nd and 23rd. He says they’ll likely take place at an upcoming meeting. And Yupiit Nation isn’t the only group talking about building new tribal government structures. For example, the Y-K Delta Regional Committee, a group facilitated by Calista, the regional Native Corporation, is also drafting a constitution for a possible future tribal government.